After a vicious sell-off and vicious rally, where is the Equity Market’s field position in the game of Risk/Reward? These disparate views are not entirely useless, they provide some degree of important assumptions and biases in our thought process. They are also a form of baggage when attempting to ascertain what an investor should do from here. 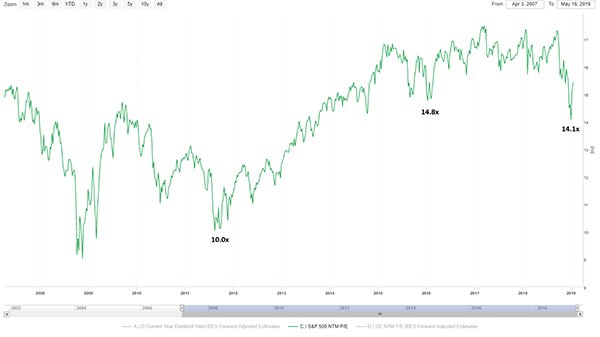 The big question that needs to be answered is: Are we still in a ‘Bear Trend’ that started last Fall, or have we begun a new ‘Bull Trend’ that started on December 26, 2018? There’s no single indicator that can answer this question with perfect accuracy. Every investor needs to find their own tools that fits with their discipline to help in the process. I’m going to share with you some of my current methods. 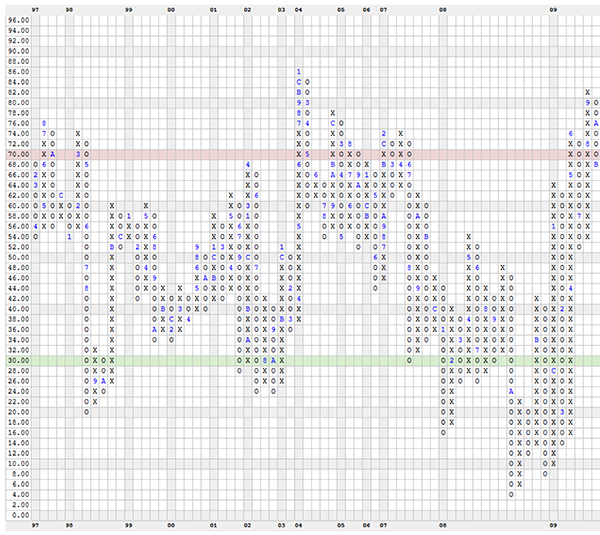 Over the years I’ve become a fan of using Point & Figure Technical Analysis. It can be used for determining trends in just about any type of asset, but it can also be used for internal market indicators as well. 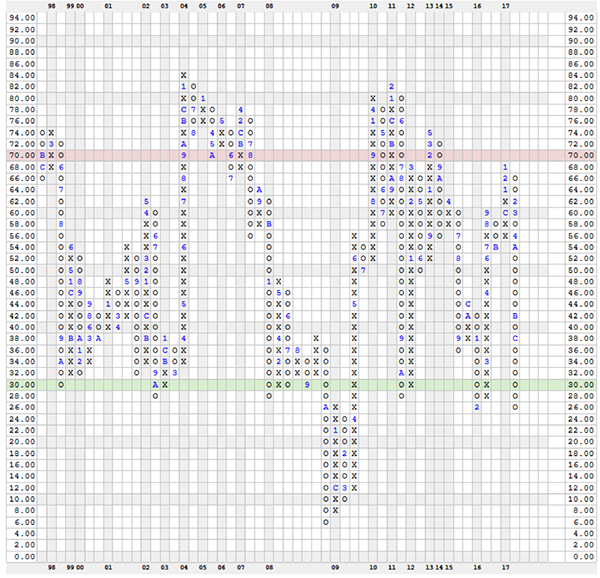 One such measure is called the Bullish Percent Index. often referred to by traders as the BPI. The BPI calculates how many stocks out of the tradable universe have generated a bullish buy signal using Point & Figure Methodology. Historically, this measure has proven to be a reliable indicator in the intermediate to long-term bottoms in the market. Source: Sentieo.com, SPY 1/1/10 – 1/25/19 with marks indicating $BPNYSE turn months. Obviously, if you were following this one indicator, then you would likely be bullish on the intermediate prospect for the market going forward. No doubt this is a key indicator in my mosaic. However, it’s rarely that straightforward of a story. First, let’s go back in time on the chart for the BPI. Here again, we can see the BPI did a good job of indicating intermediate to long-term bottoms. The periods of 9/1998, 8/2002, and of course the 2008-2009 credit crisis looked historic on this metric, as well. However, I’d like to highlight that back then the BPI twould usually have a retest. In 1998, it turned up in September, but then came back down again to retest in October. It bottomed up a bit higher that month, and then took off in November. In 2002, it came back and retested in October before once again taking off in November. 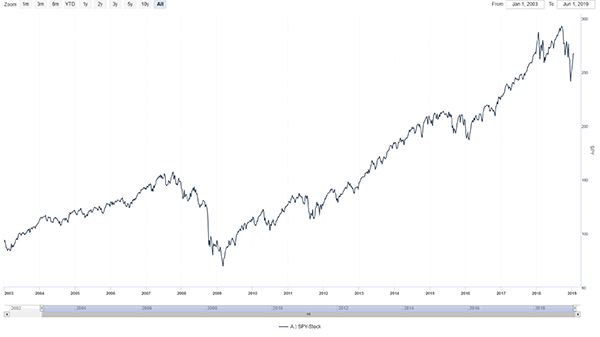 By the time the S&P 500 came back down to retest the lows in terms of price in March of 2003, the BPI was already much higher and in the mid-30’s giving a strong divergence signal. If you go back and look at the first chart of the more recent years, you can see that even in this era of ‘Quantitative Easing’ (QE), we usually see retests of the BPI when it gets into the 20’s before it takes off. 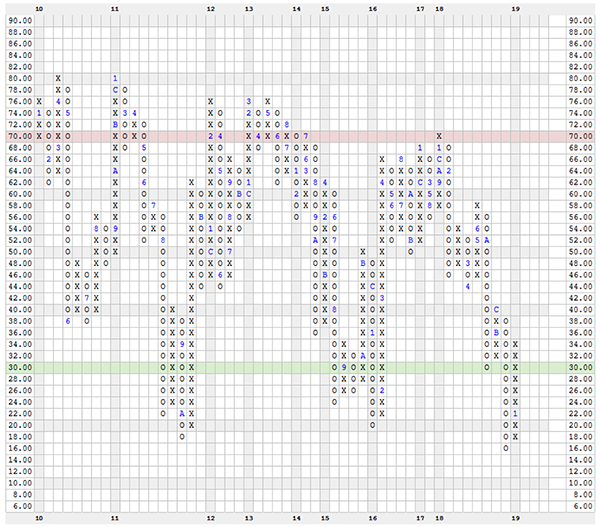 Note as well that those retests usually occur within a few months of the initial turn back up in the indicator. In this case, that would suggest we should expect to see a retest to some degree within either the month of February or March, assuming history is a useful guide. That’s not the only reason to be suspicious of the vicious “V” bottom that we’ve seen since December 26th. Yes, valuation is not a catalyst so using it as a timing mechanism is fraught with trouble, but history has shown it to be a decent predictor of long term returns. 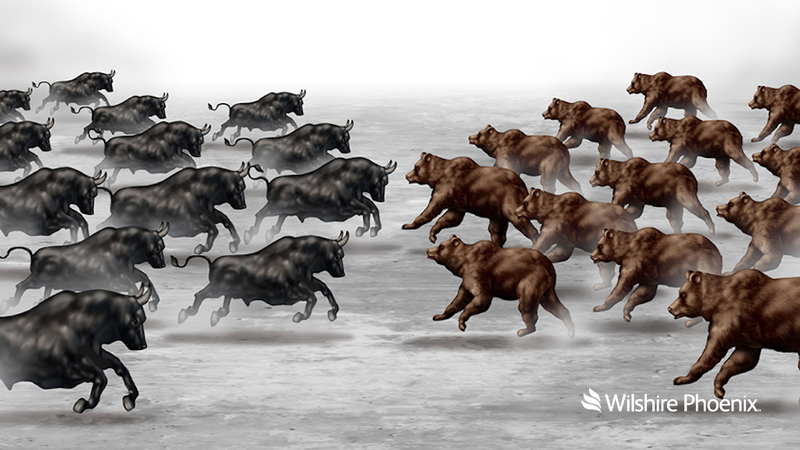 Incorporating it into our analysis can help determine just how aggressive an investor wants to be at any potential turning point in a market trend. Let’s first take a look at the QE era. 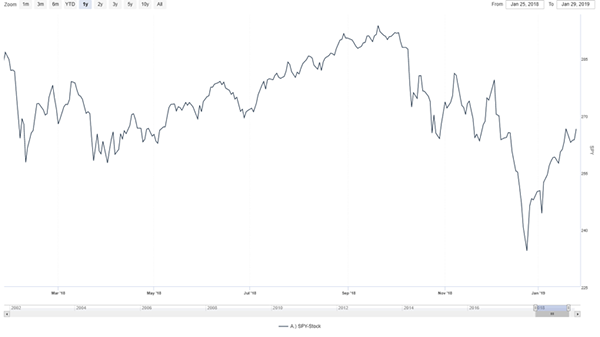 Source: Sentieo.com, SPX 1/1/07 – 1/25/19 with marks indicating S&P 500 PE NTM Ratio at $BPNYSE turning points. We have three BPI turning points to observe, and clearly there’s been a wide valuation disparity between the extremes: 10x to nearly 15x. The most recent bottomed at 14.1x. 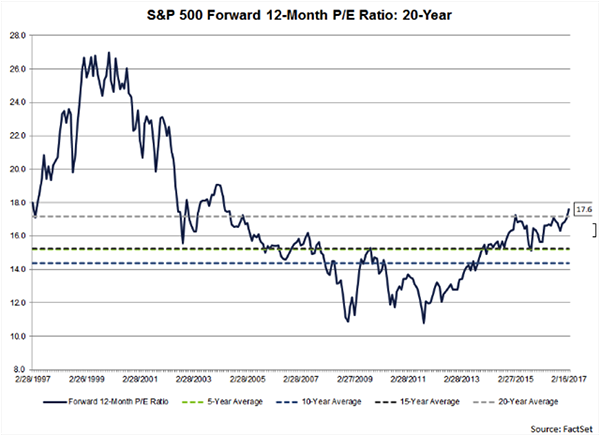 These are the Next Twelve Month (NTM) forward estimated Price to Earnings ratio for the S&P 500 (SPX). How about the pre-QE era? It doesn’t look like the forward multiple is a good indicator of market turning points-in-itself. The 1998 period saw forward multiples still at an extremely high 20x during the Long Term Capital Management collapses. Even the bottom in late 2002 saw multiples just shy of 16x, yet in this case the market put on a sizable move for the next 5 years. Unfortunately, key differences between these periods appear to revolve around what the Federal Reserve, and other Central Banks, were doing in terms of monetary policy. Source: FRED, Effective Fed Funds Rate. The relationship between either significant cuts in the Fed Funds target, or massive building in CB’s total assets, appears clear. The 2011 bottom is the outlier, as there was already stimulus occurring in the form of European and Japanese QE. Perhaps the 2011 example suggests that even at that point, the transmission mechanism between foreign QE stimulus and the U.S., had not fully healed due to post crisis strains on the global banking system. Now that we have signs that the Federal Reserve is considering to stop the minimal reduction of their massive balance sheet already, having barely achieved the smallest of reductions in their QT program, what are we to consider the stance of CB’s in relation to our BPI signal? Sure enough, beyond the U.S. Fed’s changing vocal tone to the market, the ECB and BOJ actually started to build up their balance sheets once again around the timing of the market bottom. This despite previous statements not too long ago of their desired intentions to reduce stimulus. As I sit here having seen another raucous up week in the market, with only 5 red bars on the chart in the last 21 trading sessions, and a chorus of government representatives who seem to fear nothing more than a down tape, it’s hard not to cast everything to the wind and conclude it’s all sunshine from here. So why haven’t I put all my cash to work yet? First, we’ve already discussed the likelihood of a retest. In fact, it seems like everyone is talking about the likelihood of a retest. That’s usually not a good sign to be in agreement with everyone else. 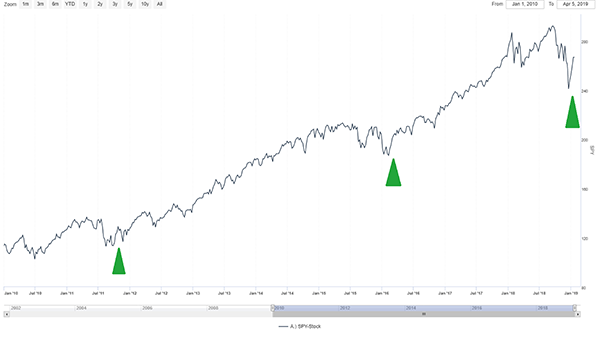 Of course, as we’ve seen in the past with the BPI, that doesn’t mean we have to see the price of the indexes retest to the same measure as we see this indicator retest, but the point is, we have a lot of history that suggests we should see something to relieve this recent rally to a degree. 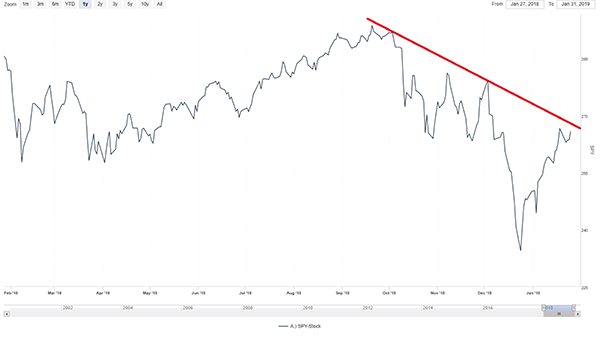 We’ve also got a significant downtrend line right above the S&P 500. That down trend line is right about 2,680 on the SPX. 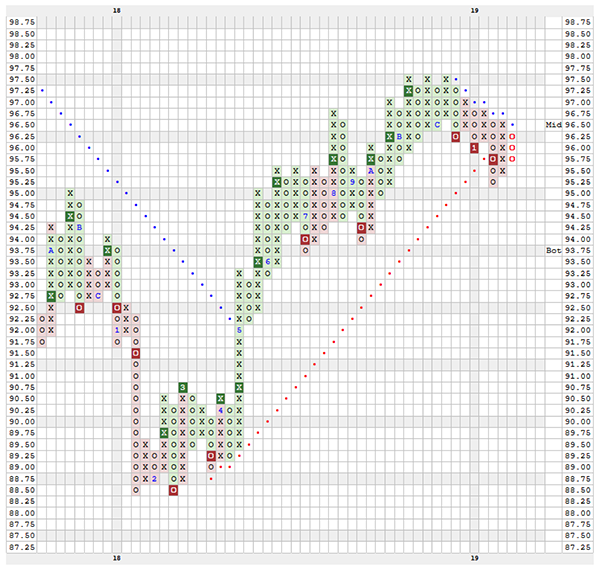 As it turns out, a Point & Figure chart for the SPX on a 20-point scale sees the same thing. That doesn’t mean the market can’t get through, but it has used a lot of energy to get here so quickly. That makes it less likely to be able to muster the final surge to get through such important levels, and thereby it increases the odds that we should see some form of a pullback first. The major indexes from a long-term perspective have not declined that much relative to the move that preceded it, but internal indicators like the $BPNYSE do suggest the bottom in December could have been a meaningful intermediate turning point. Valuation hasn’t historically been a good predictor of major market turning points, but instead Central Bank policies have been tending to be the key influencer of changing market trends. 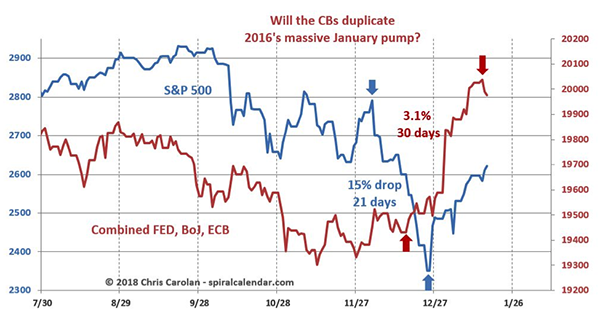 Recent data suggests that once again CB’s came to the rescue of Equity Markets in late December, and are now changing tune regarding the unwinding of their massive asset portfolios. The market has rallied straight up into the key down-trend lines and historically we should be anticipating a retest in some form of the December lows. I’ll leave you with two last points. The first is one more indicator. The companion indicator that I like to use with the BPNYSE, is called the Percent of Positive Trend for the NYSE ($PTNYSE). This measures how many stocks have been able to get through their ‘Bear Trend Lines’ and turned into positive trending stocks. The difference between the BPNYSE and the PTNYSE, is that you can have a negative trending stock generate a ‘Bullish Buy Signal’. In fact, it’s a requirement to have a stock generate a Bullish Buy Signal first, before it can get close to breaking through its Bear Trend line. Thus, the $PTNYSE takes longer and more energy to turn. This indicator, subsequently, doesn’t have to show retests from the market lows. That’s been particularly true in the era of QE. The strength of this recent rally off the lows hasn’t turned the $PTNYSE up yet, but it’s very close. If the market is able to push higher still without a rest period and turns this indicator up, then my inclination to look for deploying cash reserves increases significantly. 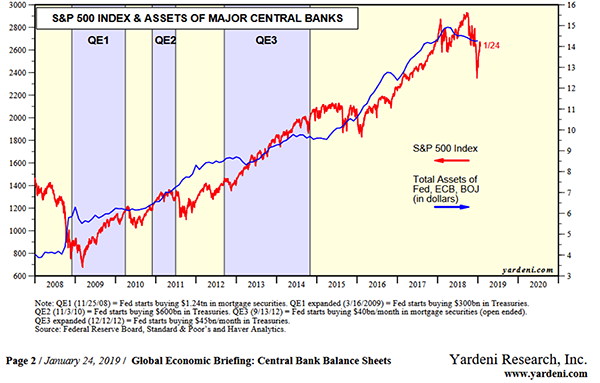 The second, and last point, is that QE clearly has had a massive impact on asset prices. The market knows this and tells the observer of its importance on a daily basis. The one thing that could derail this mechanism of influence that I can think of, (and worthy of its own detailed article), is the reserve status of the United States Dollar (USD). This is the reason why QE from foreign Central Banks still influences domestic markets. If for any reason the USD losses this reserve status and losses material exchange rate value, then I believe that the effects of the QE asset build would unwind. How that could occur goes beyond the scope of this article, but history shows that no single currency maintains this status forever, and some of the most successful investors of all-time even have been warning of the risk. I.e., don’t take it for granted, and bluntly, government policies probably aren’t helping. I’ll leave you with one last chart. Maybe it’s nothing: The U.S. Dollar Index. Source: dorseywright.com, DXY Index .25-point scale. LEGAL DISCLAIMER THE INFORMATION CONTAINED ON THIS WEBSITE IS NOT AND SHOULD NOT BE CONSTRUED AS INVESTMENT ADVICE AND DOES NOT PURPORT TO BE AND DOES NOT EXPRESS ANY OPINION AS TO THE PRICE AT WHICH THE SECURITIES OF ANY COMPANY MAY TRADE AT ANY TIME. THE INFORMATION AND OPINIONS PROVIDED HEREIN SHOULD NOT BE TAKEN AS SPECIFIC ADVICE ON THE MERITS OF ANY INVESTMENT DECISION. INVESTORS SHOULD MAKE THEIR OWN DECISIONS REGARDING THE PROSPECTS OF ANY COMPANY DISCUSSED HEREIN BASED ON SUCH INVESTORS’ OWN REVIEW OF PUBLICLY AVAILABLE INFORMATION AND SHOULD NOT RELY ON THE INFORMATION CONTAINED HEREIN. ANY EXAMPLES OF DISCRETE INVESTMENTS PRESENTED HEREIN SHOULD NOT BE CONSIDERED A RECOMMENDATION TO PURCHASE OR SELL ANY PARTICULAR SECURITY. THERE CAN BE NO ASSURANCE THAT ANY SECURITIES DISCUSSED HEREIN HAVE BEEN OR WILL BE HELD BY ANY CLIENT (“CLIENT”) OF WILSHIRE PHOENIX CAPITAL MANAGEMENT, LLC, OR IF SO HELD, THAT THEY WILL REMAIN IN THE PORTFOLIO OF ANY CLIENT, OR IF SOLD WILL NOT BE REPURCHASED. THE SECURITIES DISCUSSED ON THIS WEBSITE DO NOT REPRESENT THE ENTIRE PORTFOLIO OF ANY CLIENT AND IN THE AGGREGATE, MAY REPRESENT ONLY A SMALL PERCENTAGE OF ANY CLIENT’S PORTFOLIO HOLDINGS. IT SHOULD NOT BE ASSUMED THAT ANY OF THE SECURITIES DISCUSSED HEREIN HAVE BEEN OR WILL BE PROFITABLE, OR THAT EXAMPLES PRESENTED IN THE FUTURE WILL BE PROFITABLE OR WILL EQUAL THE INVESTMENT PERFORMANCE OF THE SECURITIES DISCUSSED HEREIN. NOTHING PRESENTED HEREIN SHALL CONSTITUTE AN OFFER TO SELL OR THE SOLICITATION OF ANY OFFER TO BUY AN INTEREST IN A CLIENT WHICH MAY ONLY BE MADE AT THE TIME A QUALIFIED OFFEREE RECEIVES A CONFIDENTIAL PRIVATE OFFERING MEMORANDUM, WHICH CONTAINS IMPORTANT INFORMATION (INCLUDING INVESTMENT OBJECTIVE, POLICIES, RISK FACTORS, FEES, TAX IMPLICATIONS AND RELEVANT QUALIFICATIONS), AND ONLY IN THOSE JURISDICTIONS WHERE PERMITTED BY LAW. NEITHER WILSHIRE PHOENIX CAPITAL MANAGEMENT, LLC, NOR ANY OF ITS AFFILIATES ACCEPTS ANY LIABILITY WHATSOEVER FOR ANY DIRECT OR CONSEQUENTIAL LOSS HOWSOEVER ARISING, DIRECTLY OR INDIRECTLY, FROM ANY USE OF THE INFORMATION CONTAINED HEREIN.